THE Welsh Proms is set to take St David’s Hall by storm again this summer, but this year’s series marks the 30th anniversary of the classical extravaganza! 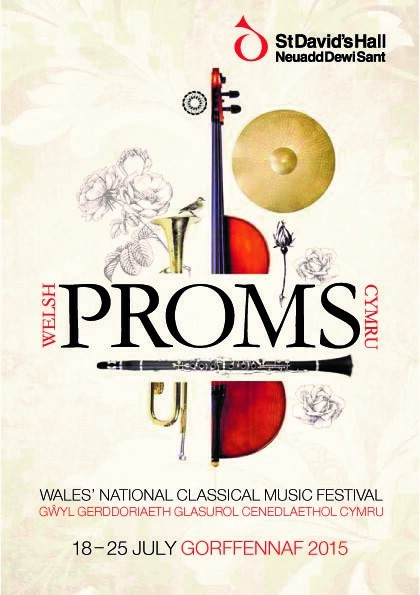 Throughout a week-long residency at the National Concert Hall of Wales from 18-25 July, the 2015 Proms will include breath taking performances from world class orchestras across a diverse and exciting programme. Opening this incredible season is the awe-inspiring Philharmonia Orchestra (Saturday 18 July, 7.30pm) conducted by the acclaimed Owain Arwel Hughes CBE. The repertoire includes some of the most dramatic music ever composed from Star Wars to Swan Lake and Sibelius to Strauss, before culminating in Tchaikovsky’s epic 1812 Overture. There’s something special to keep the kids entertained too. Also starting on Saturday 18 July and taking place at 10.30am every day for a week (excluding Sunday 19 July) is the Tiddly Proms. This brand new show entitled Cherry Pie’s Holiday Adventure, features the lovable Bert and Cherry and all their friends. This magical musical journey of seasides and safaris is guaranteed to delight tiny tots. Likewise, the Family Prom (Sunday 19 July, 7.30pm) is the perfect way to spend quality time with your loved ones. And for this special occasion, St David’s Hall will transform into a ‘Night at the Oscars’ with Cardiff Philharmonic Orchestra. Conducted by Michael Bell and compered by BBC Radio Wales presenter Wynne Evans, this rollercoaster ride along the red carpet features the world’s most memorable movie themes. Make sure to dress up as your favourite film stars! The music adopts a more experimental approach the following day with the Organ Prom (Monday 20 July, 1pm). Dynamic duo Robert Court and Jeffrey Howard will play everything from organs to iPads in the fabulous Four Hands Four Feet In Space concert. Expect original arrangements of classics by Mozart and Holst as well as sci-fi themes! One of Britain’s best-loved pianists, John Lill CBE accompanies the Bournemouth Symphony Orchestra the next night (Tuesday 21 July, 7.30pm). This spellbinding show celebrates masterpieces by Wagner, Mendelssohn, Rachmaninov and Elgar. And can there be any sound more evocative of the spirit of Wales than a 200-voice male choir? The Pendyrus, Dunvant and Côr Meibion Choirs are accompanied by the beautiful brass of The Cory Band. Brass & Voices (Wednesday 22 July, 7.30pm) promises to be a rousing evening of inspiring Welsh hymns, great opera choruses and beloved classical works. Frank Sinatra fans are in for a real treat the following night as Ol’ Blues Eyes is back for the Jazz Prom (Thursday 23 July, 7.30pm). Matt Ford and the Capital City Jazz Orchestra relive half a century of the sensational Sinatra music that captivated worldwide audiences. You are then invited to waltz the night away with the Royal Liverpool Philharmonic Orchestra as St David’s Hall becomes a grand Austrian ballroom for A Night in Vienna (Friday 24 July, 7.30pm). Sharing the stage is soprano Angharad Morgan and tenor David Fortey for an opulent evening of Strauss and Lehar. Three decades of magnificent music is celebrated in style with the incomparable Last Night of the Proms (Saturday 25 July, 7.30pm). Bring your flags and streamers as the curtain is brought down on one of the greatest dates in Cardiff’s concert diary. Joining the Royal Liverpool Philharmonic Orchestra and Owain Arwel Hughes CBE is the international brass soloist David Childs on euphonium. This stunning conclusion features world premiere performances from leading Welsh composer Paul Mealor with his Celtic Spirit composition, plus Johan de Meij’s Concerto for Euphonium. The programme also features Tchaikovsky’s Marche Slave, as well as legendary Welsh composer Karl Jenkins’ Benedictus from The Armed Man. And closing this spectacular series in a fitting manner is Gareth Woods’ Songs of Wales! Don’t miss the 30th anniversary of the Welsh Proms at St David’s Hall!